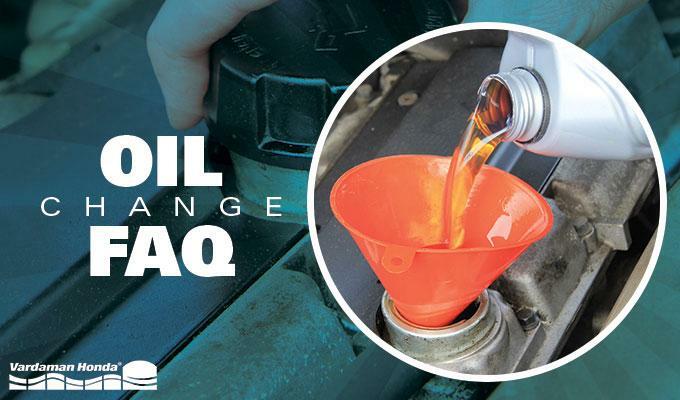 Performing routine oil changes is an important part of the regular maintenance of your vehicle, since it has the job of lubricating the engine for proper performance. We’ve put together this list of frequently asked questions to help you in understanding the up keep of routine oil changes. Why should I wait to change the oil for the first time? When that brand new Honda made it’s travel to our dealership it came with specially formulated oil. This oil is made for engine that have not yet developed their “natural” wear patterns, so we strongly suggest checking your Owner’s Manual for when your first maintenance interval is, based on your driving condition. How often should I change the oil after the first service? Every vehicle is different, so we recommend checking your owner’s manual under ‘normal service’. This will list the intervals in both time and distance, and the oil change should occur at whichever interval is reached first. Note that there is no added benefit to change your oil more frequently than the recommended intervals in the owner’s manual. Using Honda Genuine Oil, which is available at Vardaman Honda, is highly recommended for your vehicle. If this is not available to you, then it is important to use oil that has the “Starburst” certification. With this verification, the oil meets the latest performance requirements, which will work to prevent deposits and sludge as well as wear protection. Using synthetic motor oil can be used if it meets the same requirements. Your owner’s manual will inform you of what oil weight grade is needed (ex: 10W20) for your engine. How should I handle the ‘crush washer’ and the oil filter? The crush washer which is located between the oil pan and drain plug is intended for a one-time-use and it is important to replace it each time an oil change is performed. Failing to replace the washer can lead to issues with the threads of the drain plug, which can be an expensive repair. When replacing the Honda oil filter, you want to make sure that it is torque to the specifications found on the oil filter itself. Following this guideline will ensure that the filter is tightly sealed so there are no leaks.